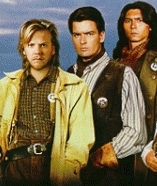 "Young Guns", billed as a brat-pack Western, did very little initially at the box office. But it must have been popular enough for a sequel. Emilio Estevez, cast as Billy the Kid, gives a lively and humorous performance as the street thief, taken in and turned around by the kind farmer, John Tunstall (Terence Stamp). When local-thug, Murphy (Jack Palance) murders his employer, Billy and his fellow employees/brothers take the law into their own hands, seeking revenge on Murphy. A stunning ensemble cast includes Lou Diamond Philips, Kiefer Sutherland, Dermot Mulroney, Casey Seimasko, Brian Keith, Terry O'Quinn and Charlie Sheen. Directed by Christopher Cain; and based on the real life trials and tribulations of William H.Bonney and the regulators.